Halo uses real WHOLE meat, poultry, or fish, and NO "meat meal" of ANY kind in our natural dog food. Our small breed grain free dog food is made with smaller kibble for little mouths, premium protein to support strong muscles, and fatty acids for skin and coat. We also have dog food options for other special diets, including puppy food, vegan dog food, and senior dog food. At Halo, WHOLE Makes a Whole Lot of Difference is the philosophy that drives our holistic approach to ingredient sourcing, recipes, nutritional value, the welfare of ALL animals, and our overall mission to change the way companion animals are fed and farm animals are raised…for the better! 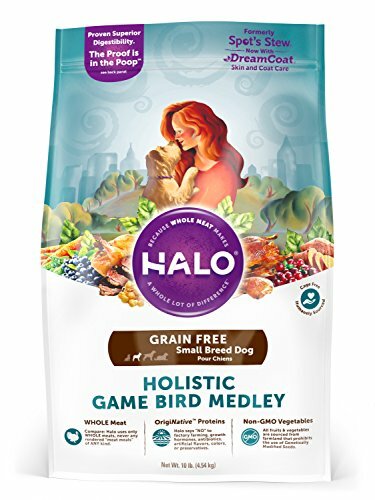 Halo uses real WHOLE meat, poultry, or fish, and NO "meat meal" of ANY kind in our natural dog food. Halo dog food is now made with Dream Coat Skin and Coat Care from non-GMO plant sources and Vitamin E—to support healthy skin and shiny coat. We also have dog food options for special diets, including puppy food, small breed dog food, vegan dog food, and senior dog food. At Halo, WHOLE Makes a Whole Lot of Difference is the philosophy that drives our holistic approach to ingredient sourcing, recipes, nutritional value, the welfare of ALL animals, and our overall mission to change the way companion animals are fed and farm animals are raised…for the better! 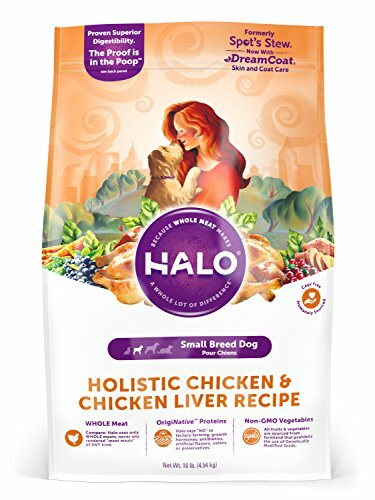 Halo Liv-A-Littles Holistic Freeze Dried Dog Treats and Cat Treats, 2.2 OZ. Halo’s Garden of Vegan is a great alternative for a protein-sensitive dog because it doesn’t contain any meat, dairy, corn, or wheat. This complete, daily, non-meat diet for dogs nourishes with protein-rich plant-based ingredients like peas, chickpeas, pearled barley, and oats. 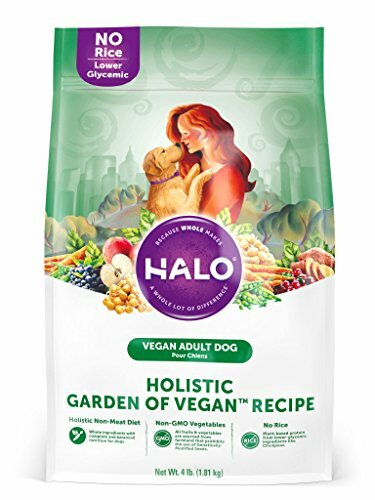 Made with non-GMO fruits and vegetables, Halo Garden of Vegan is part of a healthy holistic alternative diet—especially for families with a vegan lifestyle or those whose dogs are sensitive to specific ingredients—meat, dairy, corn, or wheat. And, unlike other vegan brands, Halo avoids rice, a less expensive and lower protein alternative. 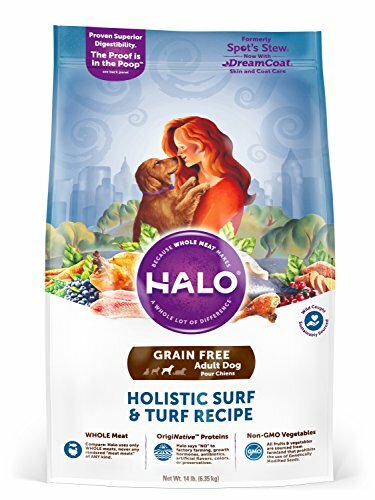 Halo also has dog food options for other special diets, including puppy food, small breed dog food, senior dog food, and grain free dog food.